“Love”, by Mr C, and a word on the female icons of his poetry. – What?! It’s Valentine’s Day! Actually, this is one of the poems by Coleridge that I have less looked into so far. Like with many of Coleridge’s titles, my impression is that it gets disregarded in favor of, well, today, mainly Kubla Khan. 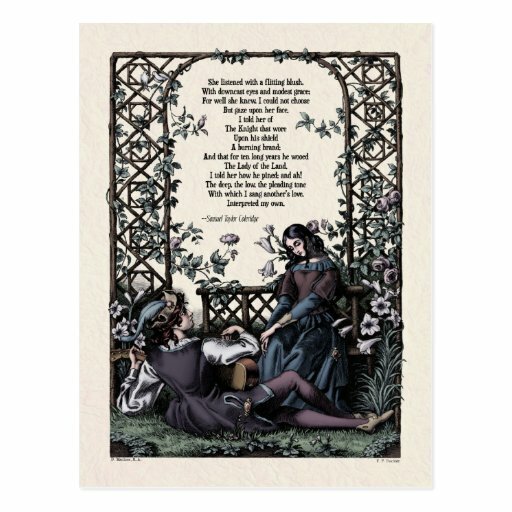 The two, most obvious observations on “Love” are, of course, that the poem’s again presented as a ballad, and that the female figure from the poem, Genevieve, appears in (at least) another text by the author. It would be interesting to do an in-depth examination of that figure, especially in comparison with Christabel. This article is probably worth a look in this context, but I really just skimmed through it, and my strong emphasis has admittedly been on the Mariner, so I am not sure what to make of some of the statements. In general, I think I agree with the author, Jonas Spatz, though: I have read some rather sensational comments where Coleridge was attributed a genuine lack of interest in sexual relations. I think those comments are, quite simply, mistaken. But more on that, later. And feed his sacred flame. My hope! my joy! my Genevieve! The songs that make her grieve. That ruin wild and hoary. But gaze upon her face. The Lady of the Land!